When I started using computers more than 20 years ago, ASCII art was popular in BBS, IRC, emails, and many other programs. Nowadays it is widely used for emoticons, although in simpler forms. Today I will share about an app that tries to introduce this form of typography art to our juniors, entitled Alphabeasties. Instead of using just ASCII characters, Alphabeasties uses a combination of drawings and letters to create the final illustration of the desired object. In fact, all the illustrations are made to highlight one particular letter at a time. The main goal of this app is to introduce letters of the alphabet in new and innovative ways, including laying the letters to depict a related object. Alphabeasties has three playing modes: Read & Write, Color & Draw, and Learn. In the first mode, you will encounter 26 pages of letter art illustrations where you start with a relatively blank page and gradually fill it with more letters until the illustration is completed. Each page is dedicated to show you how to write the uppercase and lowercase forms of one particular letter. Once you finish tracing all letters on that page, the illustration is completed and you can read the object name as it's being displayed on the top of the screen. In the Color & Draw mode, you will encounter another set of 26 pages where you can play with different tracing games to unlock the drawing mode. In addition to letter tracing games, you can also find other types of games, e.g. connecting matching objects, connecting numbered dots in order, patching stickers, tracing a way out of a labyrinth, and even free-play drawing mode. Once the drawing mode is unlocked, you can draw freely on top of the existing illustration. Erasing your doodles would not erase the underlying illustration. In the last mode, you will learn about the letters from A to Z using flash cards that resemble flip charts. Swiping left/right would lead you to the previous/next letter in the alphabet, whereas swiping up would allow you to switch from the letter view to the art view showing the associated object for that letter. The app is an adaptation from an activity book entitled Alphabeasties Amazing Activity Book illustrated by Sharon Warner and Sarah Forss. 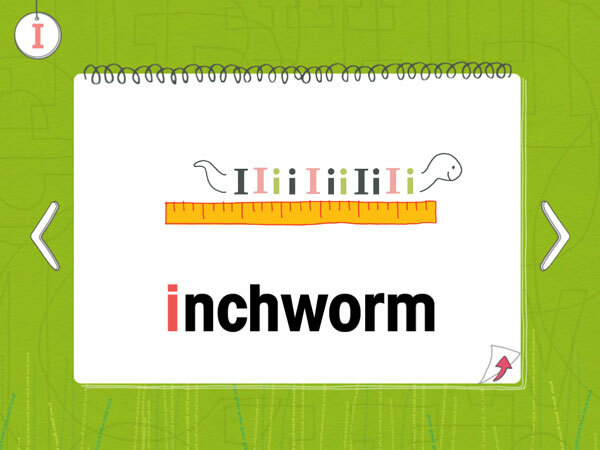 It includes several unusual words as their letter associations, such as inchworm, nest, tarantula, and zipper. Different parts of the app may also show different word associations for the same letter. For example, the letter S can be associated with Snowman in the Learn mode, and also with Swans in the Read & Write mode. Some pages in the Color & Draw mode even include up to eight new words for a single letter. This exposes your juniors to plenty of new vocabularies when compared to similar alphabet apps. There is one thing that you should note, though. Even though you can treat most of the letters in the Read & Write mode as good training ground for your juniors to practice their handwriting, there are several letters that have a very unusual writing style. For example, the tracing orders for the uppercase letter of M, N, V and W are really unusual, as shown in the following screenshot. I also find the tracing orders for the lowercase U a bit unusual. I like that the app decides to do something out of the ordinary by including unique activities in the Color & Draw mode. Especially, there are two activities that I like most in this mode. The first one is the activity for the letter A. You will find six different letters that you need to trace. For each letter that you successfully trace, the app will show you what the object is named. This activity can train our juniors to understand that there are plenty of words that can be associated with each letter. You can easily choose to start a new game of trying to come up with as many words as possible, for the other letters in the alphabet. The second activity is the one where you can put in stickers to fill in the gap of a giraffe’s neck. In this activity, you will see plenty of shape variations for the letter G. This really helps juniors to understand that there are two forms of the lowercase G that are globally accepted - even when you rarely see the double-story lowercase form in handwriting format. 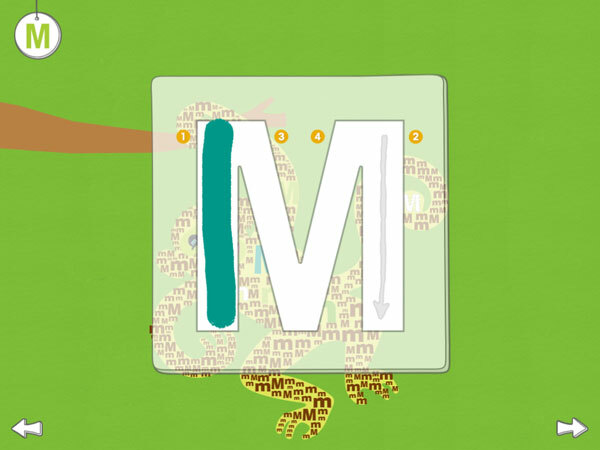 Alphabeasties brings a fresh new approach in today’s crowded world of alphabet apps. I really like the letter art approach. At least it has inspired me to figure out a way how to make it a family activity that’s easy enough to setup. But even if you're not interested in setting up such activity, Alphabeasties has plenty of fun to offer juniors as young as one year old. Get Alphabeasties on the App Store. Thank you to the wonderful people at CJ Educations for sharing the app with us. My one-year-old Noah enjoys playing with both the Read & Write mode and Learn mode. The Lonely Beast ABC. Fantastic flashcard app with plenty of fun interactivity. Faces iMake - ABC. Creative app gets kids learning the alphabet while making collages. Mini-U: Zoo Alphabet. The best alphabet-animal iPad app for one-year-olds.